Welcome Katie from Lemon Jitters! Hi guys! This is my first DIY for Hello Glow and I’m glad to be here. :) I wanted to start with something that takes minimal work for maximum impact. 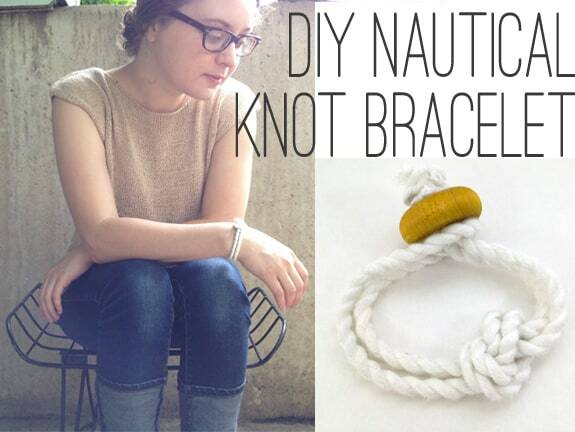 Stephanie recently posted a tutorial for a nautical necklace so I’m bringing you a complimentary nautical knot bracelet. 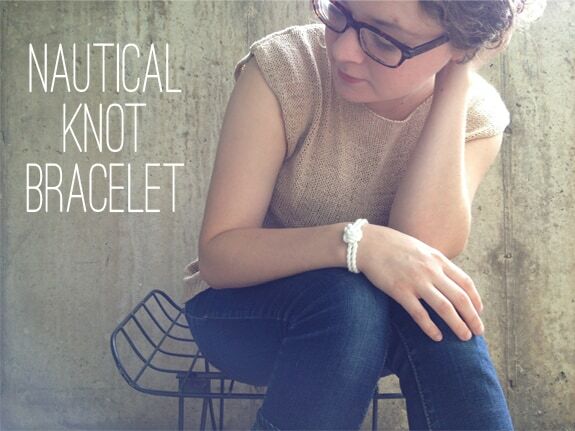 Read below for the steps to this easy knotted bracelet! The supplies are super basic. 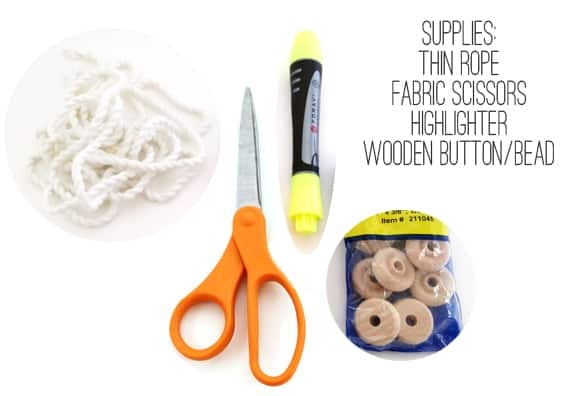 I got this thin white rope from Hobby Lobby for .99 cents (on 50% ribbon day, of course). To find the correct amount of rope – I wrapped the rope around my wrist three times, left a little extra and cut. This appears more difficult than it actually is. It is very easy if you follow the steps exactly. 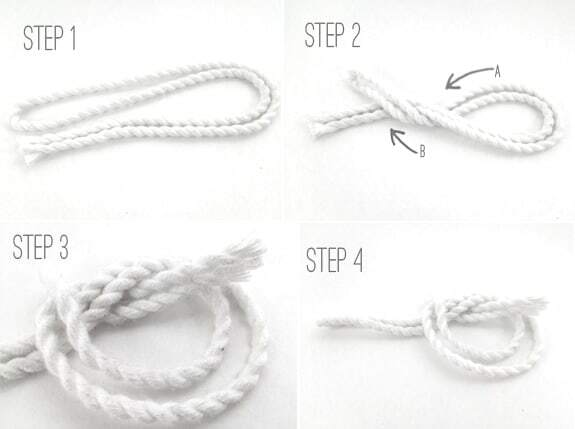 Step 1: Fold your rope in half and then half again. Lay it down with the looped in to the outside, as shown in the photo. Step 2: Pull your looped end under the loose ends and back over the top, as shown. Step 3: Now pull your loose ends through the big loop you have created. Step 4: This should start to form your knot, tighten the knot wherever you want it (thinking about the placement of your end knot and the possibility of cutting loose ends). 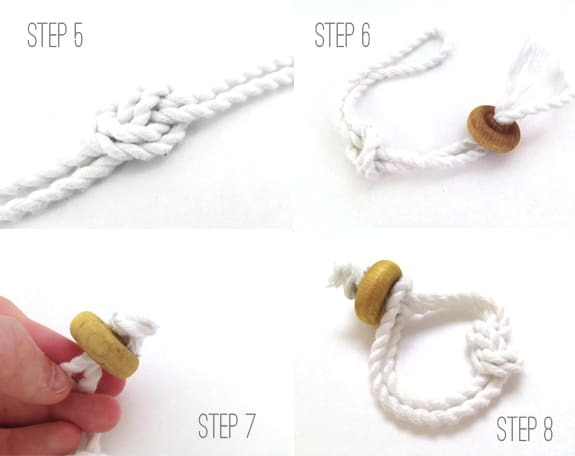 Step 5: Make sure you keep the knot flat, you should be pushing it down into shape. Step 6: Thread your bead through the loose ends. Step 7: Tie the loose ends into a knot, seal with hot glue (or any glue that will keep the ends from fraying). Step 8: Now you can secure your looped end over the big bead. Voila! And that’s it! Enjoy your nautical bracelet and pair it with Stephanie’s necklace for a fun summer look. Where did you buy the rope from? LOVE this!! I need to pin it so I can make it soon! Very elegant – love it! I just bought an anchor print top that would look lovely with this bracelet! Oh, you’re so on trend! :) I love the nautical look in summer – makes me feel like I should be yahting somewhere! Thanks lady! You should make some with your girls! OH, this is so pretty! I was thinking you could even incorporate that knot into some hanging art work! Thanks for sharing! Moving to a new house I’ve realized we have approx 5 million pictures! This would be a fun way to hang them!! So easy and so chic! Great job! You read my mind! I was just searching nautical knot jewelry the other day. Very cool. Great minds think alike! :) I bet there’s all kinds of cool knot jewelry on Etsy.